We believe that in order to lay the foundations for an epistemology of LANSAD, it is necessary to break with the institutional, pedagogical, and political origins of the acronym and the reasons that led to its existence, and to question rather the genesis of foreign languages for specific purposes in Europe and the way specialist discourse has circulated and been taught. It should be recalled that the interactions between specialist knowledge, target/source languages, and the actors of these scientific and cultural exchanges are what define the LANSAD field. From this perspective – which we refer to as genetic, in the sense of Piaget’s genetic epistemology or Foucault’s work on the archives of knowledge (1969) – we compare and contrast the foreign language of law, the paradigm of territoriality (Deleuze & Guattari, 1980), with the foreign language of science (thinking that spreads through a network, with the intention of having universal scope). This has an impact on how these two objects are approached within didactics. From this point of view, the semantic obstacles to learning a language for specific purposes are also different: in the case of scientific English, for example, while a foreign scientific language often uses a universal code (e.g. algebra) and produces a fairly homogeneous form of discourse (biology or physics), the language of law poses huge difficulties because a transparent signifier refers to a very different signified (e.g. contract, crime, constitution). Two workshops have already been organised within the context of this project. It will also lead to a conference in November 2015 that will focus on the role of TICE over the coming twenty years in three teaching contexts: school, university, and professional training in small businesses. 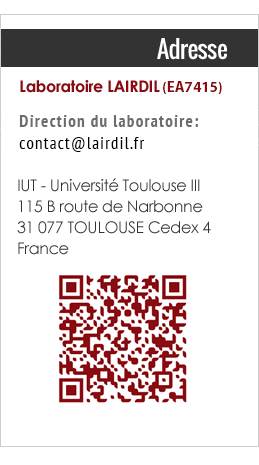 Two laboratories from the Toulouse site are involved – the LAIRDIL and the UMR 5263 Langues, Langage, Ergonomie “Laboratoire Travail et Cognition” (Languages, Language, Ergnomics “Work and Cognition Laboratory”). We hope to be able to put in place an observatory of the use of TICE in training that will serve as both a research tool for the laboratories involved in this project and a training tool for the actors involved in training design in their establishments, as well as allowing dialogue between these different actors. One of the teams of the Toulouse IUT successfully met the challenge of automatic annotation of the English language in 2013. Today SWANS uses an algorithm (a “syllabifier”) that uses a SAMPA dictionary to generate instant syllabic annotation on the basis of phonetic transcriptions. Our aim for the two years ahead is to develop knowledge of the interference of L1s with a view to adapting to the needs of multilingual classes and moving beyond an out-dated monolingual and ethnocentric approach to language learning. Rapid changes in the use of foreign languages in the working world, and particularly in the field of industrial aeronautics, inevitably affect the teaching of languages at university (particularly the use of ICT). With a view to narrowing the gap between the language learnt in a university context and the language used in the work context, the laboratory proposes to create an Observatory of the Use of Languages in Business. The pilot project concerns aeronautical companies and the various training programmes run by the university that are linked to the aeronautics industry. Check your Smile aims at developing a collaborative multidisciplinary and multilingual platform to help LSP students learn LSP vocabulary. This is a user-generated content platform which offers several serious games for Vocabulary Learning. Shall you wish to support this interuniversity project which was selected as an IDEX project (Initiatives of Excellence -Pedagogical Platforms) in late 2015, please do not hesistate to like the Facebook page here. We are welcoming any proposition of collaboration (both for user tests and research experiments)! Thank you! SAMPA is the acronym for Speech Assessment Methods Phonetic Alphabet. It is a set of phonetic characters. Jean Piaget (1967) Logique et connaissance scientifique (Paris: Gallimard) & Michel Foucault (2002 ), The Archeology of Knowledge (London & New York: Routledge). Gilles Deleuze & Félix Guattari (1987 ), A Thousand Plateaus: Capitalism and Schizophrenia (Minneapolis: University of Minnesota Press).